TruckSeries delivers our exclusive, best-in-class truck repair information for Class 4-8 trucks in a single location. With the TruckSeries commercial truck repair guide at your fingertips, you can speed up repairs, increase the number of repairs your techs can do, and keep trucks rolling through your bays. Now you can stop flipping pages in those old printed commercial truck repair manuals, swapping disks or calling a service line. You’ll have complete, automatically updated and enhanced information whenever you want it. Get all makes coverage from 1990 forward, in one location, with one login. You can use the time you save looking up information to repair more medium and heavy trucks in your shop. Our digital commercial truck repair software includes our exclusive full-color wiring diagrams. These fully scalable diagrams are the very best in the industry and will make it easier than ever to troubleshoot your truck repair issues. With TruckSeries, you can take the guesswork out of your next truck repair job. Full-color high resolution digital pictures of components, connector views and locations are included, giving you access to the industry’s best real-world insights, before you even pick up a wrench. 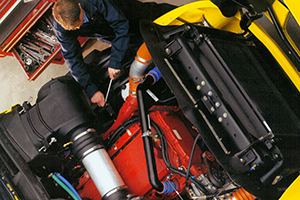 Finding the specific torque specifications you need for the job can quickly become a hassle. With TruckSeries there is no more hunting around for specifications separately — with context-sensitive specifications, torque specs are always available for your current vehicle lookup. Tired of trying to remember each OEM’s particular approach to information? With TruckSeries, you’ll find all our exclusive, best-in-class repair information presented in one consistent, easy-to-use format across all of our digital commercial truck repair information. New content is automatically added every 30 days, so you can rest assured knowing that you have the most up-to-date repair information without the hassle of manually installing update data via disks.